I scrounged these up a while back and just now decided to test them out as a part of another project I’m starting. 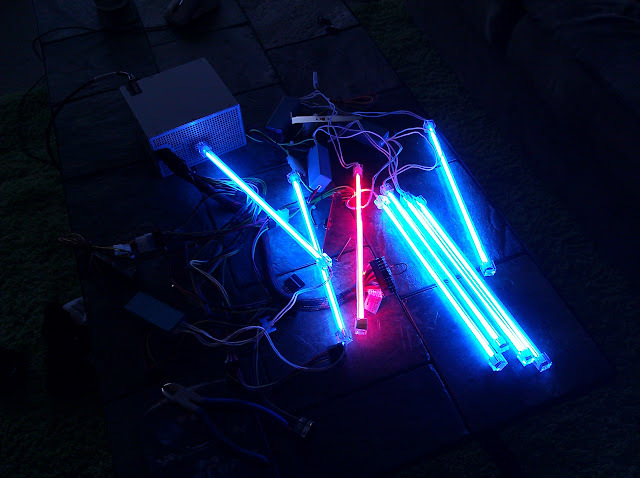 They’re CCFL bulbs, cold cathode fluorescent lamps. Each driver powers two lamps; I have 8 connected. Naturally, they’re 7 blue and 1 red instead of 8 of the same color. Each runs on 12V DC with molex connectors and are usually run off a computer power supply. (I’m interested to know the current ratings on them, which may spur another project…a multifunctional plugin-in ammeter.) These will eventually be triggered lighting inside a backlit cabinet, powered on only when it’s open. This entry was posted in Electronics, Hardware, Projects and tagged 12V, blue, cabinet, CCFL, computer power supply, red, salvage, surplus. Bookmark the permalink.